Be prepared for Crisis, always ‘ante portas’. When we were preparing the “Crisis Preparedness Workshop”, we’ve measured all the corporate crisis reported in media. The list has 200 corporate crisis within the last 8 years in the US and E.U!! Siemens, Whole Foods, Novartis, Uber, VW, Chipotle, Fifa, Starbucks, Facebook-Analytica, Halifax, Google. The list is long. If you google “crisis, cases” you’ll see thousands of examples of quotes, hard-facts, studies, crisis response cases …and tension. But most probably if you ask a CEO to prepare his units for a crisis, you will get a response like “it can’t happen to us; we have more pressing matters to attend“. Even multinationals expect to get support from the HQ, only when some issue occurs. But what is the real cost of ‘investing’ few hours and resources to be crisis-ready? Is it corporate arrogance, or pure incompetence to prepare proactively for business continuity and perception risks? The Siemens case was estimated at a direct cost of $2,2 billion. The VW emissions’ scandal retracted back some million cars. The food giants in the US pay constantly fines when accused of their product ingredients, or for their employee policies. Even a local rotisserie in my hometown is against customers who happened to visit its kitchen… Yes, I know “it can’t happen to us…“. The Uber lost its London license. Google was accused of its autonomous car-crash (to a school bus) and then for tax evasion in many EU countries. Consumer rights against company practices skyrocket in the Ombudsman’s list in almost every European country. I know, “it can’t happen to us…“. When we were preparing the “Crisis Preparedness Workshop” back in Nov. 2017, we’ve measured all the corporate crisis reported in media. Can you picture this? The list has 200 corporate crisis within the last 8 years in the US and E.U.!!! Siemens, Whole Foods, Novartis, Uber, VW, Chipotle, Fifa, Starbucks, Facebook-Analytica, OTT revenue, Halifax, Google. Long list. YouTube has taken the heat off the Facebook-Analytica data crisis, thanks to revelations it is still running adverts on video channels promoting paedophilia, white nationalists and North Korean propaganda. Overnight, same day, an investigation by CNN claimed that advertising for 300 companies including retailers, tech giants, newspapers and government agencies had been running on extremist video channels. Virgin America was the first to offer onboard Wi-Fi in 2008. No one could predict that the day would come when an aviation emergency would be broadcasted live, as Facebook live, real-time by a passenger. On April 17, 2018, a passenger on Southwest Airlines Flight 1380 broadcasted what he thought was his final goodbyes after an explosive decompression on the aircraft. “Something is wrong with our plane… we are going down!” shouted passenger Marty Martinez through his oxygen mask in a live stream seen by just a handful of followers at the time, but has since been shared/viewed more than 540,000 times within the next 24 hours. Tragically, a woman was killed, making this the first fatal event on a U.S. airline. Search and you’ll get amazed. The many airline crisis cases have sparked a global initiative by the International Air Transport Association (IATA) to redefine and codify “best practices” in aviation crisis communications for the digital age. Since British PM Theresa May put her country on the path toward a “hard” Brexit, facts on the ground have repeatedly forced her to scale back ambitions and make concessions to the E.U. She continues to muddle through, making Brexit kind of a crisis-management plan towards lobbies, enterprises, consumers, EU students, travellers, financial markets, banks and …voters! Greek government faced in 2017 the Crisis management failure: Athens’ Riviera oil-spill and later on in the same year, they failed on infrastructure and civil protection and infrastructure set up to tackle floods in the Attica region, leading to 22 people dead. The word Crisis suggests something that happens infrequently. But crises have become a regular state of affairs. Brands have found themselves embroiled in controversy. And those that deal with PR challenges regularly have still been caught off guard by a customer insurgency. Some crises disappear quickly and others never seem to go away. Facebook-Analytica is the latest example of a “PR disaster”. The term usually means that whatever the facts of the matter are, the company’s CEO fails to communicate convincingly about a crisis, sincerely and in a timely manner. Mark Zuckerberg issued a statement using “corporate speak” and online communities demanded apologies for a) FB knowing the issue for two years, b) what they will do in the future for data protection. When something goes badly wrong for a company in public, all eyes look to its leader. When the CEO is absent, or hides, or has nothing to say, or fails to respond then the information vacuum is instantly filled by naysayers whose voices become a chorus of condemnation on social media. In most cases, the failure is on leadership communication. Failure by the CEO to attach more importance to corporate communication and listen to PR professionals. With digital technologies firmly entrenched, the role of the CEO in corporate communication has never been more essential. A CEO singing in the middle of a Merger? Sainsbury’s is in the middle of a merger with Asda. 12 billion value. Important evolution. Thousands of stores, consumers, partners, importers working with the brands. Fame and reputation should be intact. Sainsbury’s CEO, Mike Coupe, has been filmed singing and humming “We’re in the Money” while waiting for an ITV News interview. ITV New released the clip and it became viral. We can discuss for long if it was a right practice from the media house, but the thing isn’t funny for the CEO. The media titles were “Astonishing moment Sainsbury’s CEO sings ‘We’re in the money’ in front of TV cameras as he awaits interview to discuss his firm’s merger with Asda“. Mr. Coupe apologized for offending anyone and said he was trying to compose himself and that the song was an unfortunate choice. If you have a 12 billion deal at stake, before government and regulators’ approval, and media reporting on the brands and the story …how irresponsible, immature and unprepared executive can you be, to turn the attention away from the deal, and the two brands? Media scrutiny, backed by an insight of worthy causes, social justice, inquisitive journalism etc. If your company is like many organizations, then there are great risks that may be leaving your brand unnecessarily exposed. Primarily, your own company operations. Customer service, product faults, regulation, health & safety, energy footprint, social contribution, network outages, failed delivery, security, data privacy, and financial aspects of what your company does. Everything can turn to be a major crisis incident. Allegations, complaints, attacks, and negative stories on media. Communities are talking about companies, policies, experiences, prices, complains, and evaluate if you stand true to any brand promise. Consumers can become very cynical about flight attendants, bank cashiers, rude customer service staff in-shop while always compare competitors. Companies will never “control” or “direct” perceptions in the open, peer-to-peer economy. Have you ever really thought how big this change is? No more paid media or native (paid) content to “contain the story”. CEOs, University Presidents, Directors of Boards, Team leaders must openly engage their communications team and be Crisis-ready – not when the story goes public. This e-Book has been written with the purpose of equipping C-level teams, senior Communicators, and Marketers with some angle-views and tips on preparing and stay alert for upcoming crisis incidents. Get the Crisis related e-Book and subscribe to the Crisis-ready community. Success! 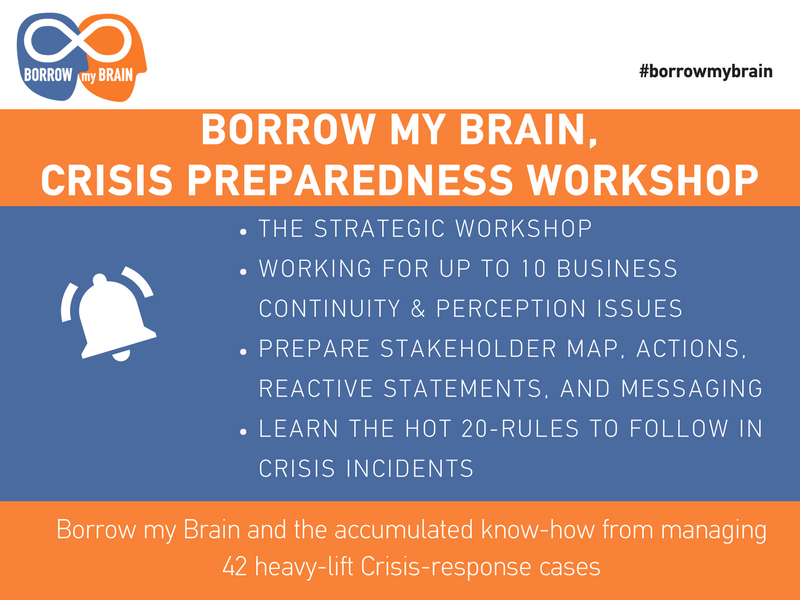 Now check your email to download the free e-Book "Tips for Your Crisis ante-portas" from borrowmybrain.eu. Please check your Promotions, or Spam folders in gmail since we don't communicate often. Thank You! To prepare for the crisis means that you have an agile counter-response activation. You need top management’s ‘buy-in’. If they don’t believe in it, or if they don’t see risks, then sit and wait, and who knows you can be lucky. There are several common reasons behind the resistance that many companies show when one tries to convince them to be crisis ready. Sadly egos and fear win, and company’s communication teams get ignored. Companies must treat the communications for issues and crisis management, in the same manner, they so with the IT department to prepare for a cyber-attack or operations experts to be ready for a natural disaster. 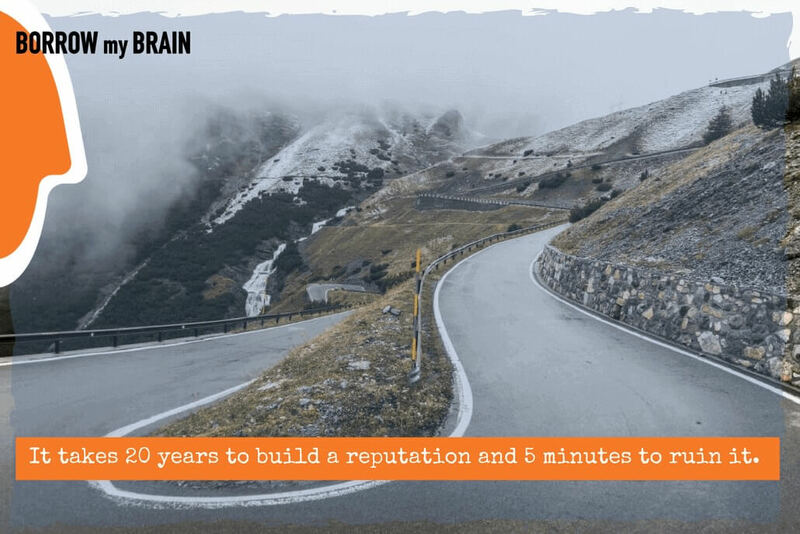 PR professionals are the crucial team members who ask the tough questions, dig deep into the issue for the truth, inspect the situation from every reputation angle and help the brand communicate the facts while protecting reputation. Back in time, every company’s local executive team was treating the crisis as something that can impact the main Brand…the HQ. It’s no longer true! With the global treaties at hand, with the loud voice of communities over social media, and regulators under pressure to scrutinize company operations, you can’t be reactive. Googling for crisis’ cases, we’ve found even news from the Chinese green regulator (imagine, even in China where news are controlled to some extent, nothing can be ‘contained’) who called-off 151 coal power plants (good for them and the planet…), an investment plan of 80 billion! Is your company ready to tackle business continuity and perception risks? Tasos Pagakis is a Crisis communications expert within Telecoms, Energy, Pharma, Financial, and FMCG. Has participated in 8 company Merger & acquisitions. Worked for 42 ‘heavy-lift’ crisis including death by accident, Telco radiation, Company restructuring, Petroleum pipeline, Bribery allegations, Security systems, Food contamination, Network outage, Factory-river pollution, Consumer rights etc. As of 2016, he facilitates Crisis Preparedness Workshops for Companies and Authorities. Download the 10 Immediate Crisis-response actions.